On September 26 three Westland Sea Kings from the Royal Navy undertook a ceremonial last flight after 49 years of service. The trio of 849 Naval Air Squadron Sea King ASaC7 helicopters took off from their home base at Royal Naval Air Station Culdrose in Cornwall for a flight that took them for a fuel stop at RNAS Yeovilton and a flypast of the Yeovil factory where they were made, before landing at the HMS Sultan base in Gosport to await disposal. A fourth Sea King followed them by road. The retirement of the last Sea King airborne surveillance and control aircraft leaves the Royal Navy with a surveillance capability gap. Nicknamed the "Bagger," the ASac7 was a development of the initial AEW.Mk 2 airborne early warning variant that introduced a Thorn EMI (now Thales) Searchwater AEW radar. It was carried in an inflatable bag on a swiveling fuselage-side pylon. Introduced in 2002, the ASaC7 was a modernized version with Searchwater 2000 radar. As well as its AEW capability, the later radar proved an excellent overland sensor, able to spot features as small as wheel tracks in sand. As such, it was valuable for counter-insurgency missions in Afghanistan, where the ASaC7s flew more than 2,000 missions during a five-year deployment. Replacing the ASaC7 is the “Crowsnest”-modified Leonardo Merlin Mk 2, which are being outfitted to carry the Searchwater radar. They will not enter service until 2020, in time to provide air, land, and sea surveillance for the Royal Navy’s new aircraft carrier, HMS Queen Elizabeth, which is currently conducting operational trials off the U.S. East Coast. 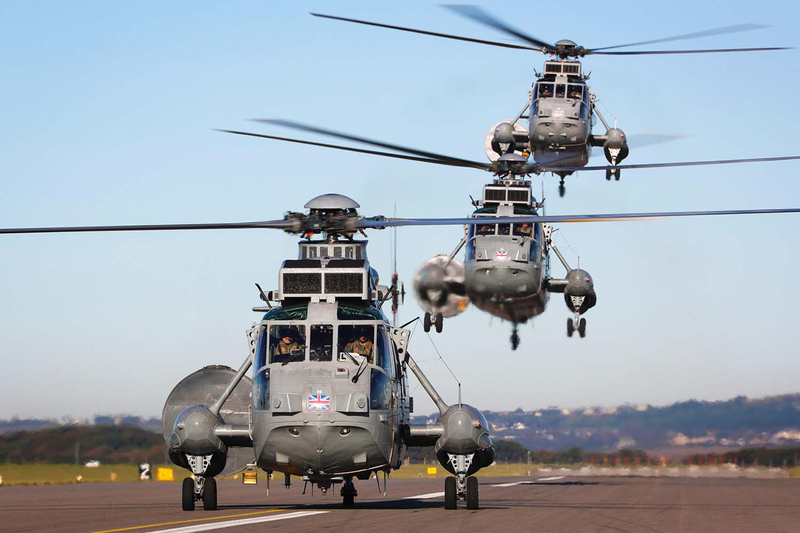 Merlin variants have taken over the roles previously performed by the other Sea King versions that were retired earlier. The retirement of the ASaC7s has not spelled the end of airworthy Sea Kings in the UK, however. Based at Portland, Dorset, commercial operator HeliOperations has leased two former Royal Navy HU.Mk 5s to conduct search-and-rescue training, initially on behalf of the German naval air arm. A Westland-built Sea King first graced UK skies on May 7, 1969, the company (now Leonardo) having extended its existing license agreement with Sikorsky to cover production of the SH-3. Four U.S.-built machines were provided for development and trials. The UK’s aircraft differed in many respects from the SH-3, notably in having Rolls-Royce Gnome engines in place of the General Electric T58s. The first was handed over to the Royal Navy for service in the anti-submarine role in August 1969. With subsequent versions, the Sea King was also used for search and rescue, assault transport, airborne early warning, and anti-surface warfare, and saw action with the Royal Navy in the Falklands, Balkans, Sierra Leone, Iraq, and Afghanistan. Westland-built Sea Kings were sold to Australia, Belgium, Egypt, West Germany, India, Norway, Pakistan, and Qatar.